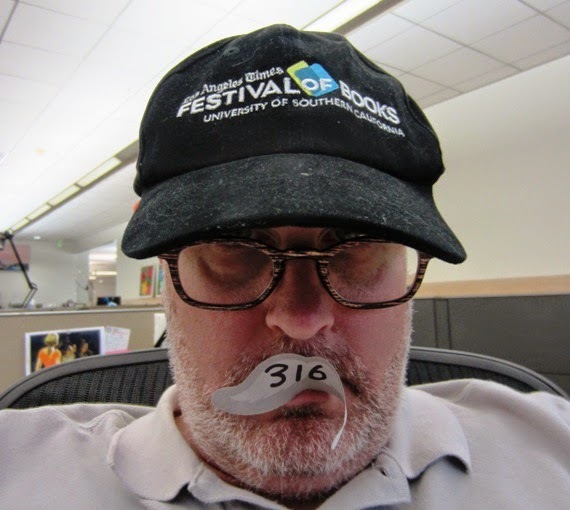 Day 316 / Hat 316: Black, baseball-style cap with multi-color embroidery on front that reads: "Los Angeles Times Festival of Books University of Southern California." Interior tag reads: "Gear for Sports Headwear, 100% cotton made in China, RN # 49314." A promo cap for the upcoming, you guessed it, Los Angeles Times Festival of Books, (taking place this weekend -- Saturday April 12 and Sunday 13 -- on the USC campus in downtown L.A.) graciously loaned to the Project by Tracy Boucher. It's actually been sitting on the corner of my desk and I figured if I didn't post it today pretty soon I'd be flipping the page and the opportunity would be gone. As someone who spent his growing up years NIB (Nose In Book), I always enjoy the FOB. Last year I caught a panel discussion on single-subject obsessions like duck stamps, tacos and the race to build the world's most complicated watch (which I wrote about here), the year before that I sat in on a talk with children's author Judy Blume (recapped in "Are you there Judy Blume? It's us, your fan base"). Shameless plug for the mothership? Yeah, I suppose so. But I'll tip my hat (and anyone else's for that matter) for any book-centric event. What Are You Looking Hat?? ?